Eventually, the odds are good that you will get a flat tire on your vehicle. Roadside Assistance offered from one company or another is popular, but it is always a good idea to ensure that you have the knowledge to change one yourself, especially with the high cost of tow trucks in Milton. The guide below lists the steps that you will need to follow to get back on the road quickly. Pull over to a spot that is safely off the road. Go as far onto to the shoulder as you can. If you happen to have been driving on one of Milton's busy highways, such as the 401 or QEW, get off the highway completely, even if you have to drive a short distance with a blown tire. Never park on a curve. Visibility for other drivers is limited and they may not have a chance to see you. Find a spot that is flat and level. Never decide to jack up your vehicle on a hill. Leave your vehicle in gear if your vehicle has a manual transmission. Always engage the parking brake! Turn on your 4-way flashers, otherwise known as hazard lights. Get the spare tire, wrench, and jack out of the trunk in your vehicle and grab any other tools that may be required. Place everything in front of your flat tire. Loosen the lug nuts with the wrench. It may be required for you to remove the hubcap. Do not actually take the lug nuts off at this point, simply make sure they are loosened by turning the wrench counter-clockwise. 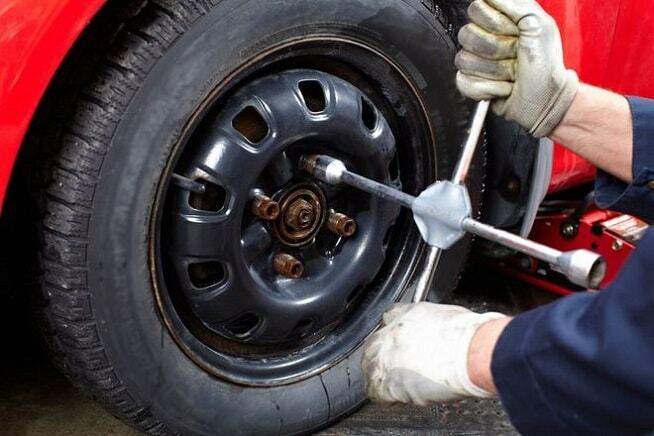 If you find that the lug nuts on your vehicle are overly tight, one option is to place the wrench on the tight nut, and stand directly on the arm of the wrench so that all of your weight is utilized. Another option is to pound on the wrench arm with a hammer or a rock. Following the instructions included with the jack, raise your vehicle off the ground. There is no one-place fits all when it comes to jacks. Refer to the owner's manual to see exactly where it should be placed on your vehicle. The vehicle should be lifted with the jack until it is about 6 inches above the ground. Now remove the loosened lug nuts and pull the tire towards you until it is no longer secured to the wheelbase. Put the lug nuts in a safe place where they are not able to roll away. If you have a pocket, this is a perfect holding place. Place the spare on the lug nut posts and push the tire away from you until it is firmly pressed against the wheelbase. Put the lug nuts back into place. Loosely tighten the lug nuts by hand so the spare does not fall off when the vehicle is lowered to the ground again. Slowly lower the vehicle back to the flat surface with the use of the jack. Take the jack out from underneath the vehicle. Tighten up the lug nuts again using the wrench. Pick one lug nut to start with and tighten it to around 50%. Next, move on to the lug nut that is the opposite of the one you just tightened and tighten it to about 50%. Follow this process until they are all about 50% tight. Go back and tighten each lug nut individually until they are as tight as you can possibly make them. Place all of the tools and your flat vehicle tire back into the trunk. Ensure that nothing has been left on the side of the road. Sometimes the tire may not be destroyed completely when it goes flat. In some cases, if the tire on your vehicle has gone flat due to a sharp object such as a nail being embedded in it, you can generally buy yourself several more kilometers of driving time by using a specialized spray for fixing flats. This is especially useful if you are unable to physically change the tire yourself. The spray will give you the time needed to come in for Precision Service at Gorruds Auto in Milton, Ontario, Canada. The expert technicians will replace the tire for you in only moments. Likewise, if the tires on your vehicle appear to be worn or the tread is cracked in places, bringing your vehicle into Gorruds Auto will give the Precision Service team the opportunity to thoroughly inspect and replace tires as necessary.